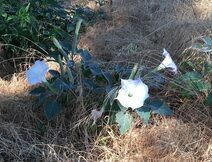 These plants are known as Datura Stramnonium, or more commonly called Jimsonweed or Angel's Trumpet. It is a summer annual broad leaf plant. All its parts, especially the seeds, contain alkaloids, and when ingested, are toxic to humans and livestock. The trouble is, they grow everywhere---along roadways, ditch banks,creeks, and they thrive next to wastewater. 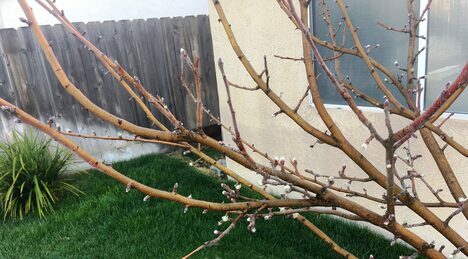 While being a nuisance, they take on a beauty when in full bloom, sort of like The Ugly Duckling. Sometimes people are that way. Depending on how you look at them, they can be a troublesome weed, or something beautiful. You know the type---the relative that has caused you more trouble and pain than you'd care to mention. Or, maybe the obnoxious person who just cut you off and almost caused an accident, simply because they wanted to be one or two cars ahead. Or, they could be the homeless man or woman, wanting you to dig into your purse or wallet. These all can be bothersome weeds in your life. I was rewarded in a strange way some time back. While spending a Sunday afternoon with Judy, bouncing from one antique store to another, a homeless man I had seen many times in Oakdale was shuffling along the sidewalk in front of us. It was obvious he had some severe mental problems. The weather was pushing the mid to high 90s, and he was fully dressed, including a full-length coat. As we crossed the street, on a whim I said hello and asked how he was doing. The man looked at me with a shocked expression, then grinned and told me he was doing fine and thanked me. He then shuffled on past without asking for a thing. It only took approximately thirty seconds, but it was easy to see I had made his day, perhaps his week or even his month. A weed? No, I think he was extremely valuable to God, and at that moment to me also. Try it. Take 20 or 30 seconds of your time to give a smile and say hello. It won't kill you. And just maybe like the Jimsonweed, you'll get a glimpse of some hidden beauty. About ten years ago we decided to have an in-ground swimming pool installed in our back yard. After taking several estimates, we hired El Dorado Pools out of Modesto to do the job. The finished product was everything we expected --- a large kidney-shaped lagoon affair with a waterfall and lagoon bench and a six-foot deep diving area. We instantly began using it, and have had countless backyard barbecues with family and friends, adding an outdoor kitchen with a grill, a sink and refrigerator, then a gas pool heater to extend the swim season into the fall. Needless to say, with a big family of six adult children, seventeen grandchildren and four great grandchildren, pool safety has been a priority. As an added precaution, we installed a safety fence, much like you see surrounding motel pools, which we have recently removed now that the young ones are a little older. The rule that parents must be present while their young children are in the pool still stands. Climbing the rock waterfall is forbidden as well as diving or jumping into the pool while swimmers are in the diving area. There are also a few universal rules, such as no running around the pool and watch where you're walking. It only takes a careless second to inflict pain on someone and spoil an entire day. It might sound like a lot of rules, and I guess that’s true, but Judy and I want swimming and playing at Grandma and Grandpa's house to be a pleasant and happy experience for everyone, young and old alike. There are times when the rule-maker fails to follow his own rules. A few days ago we woke to a cold rainy morning in Oakdale, knowing outside chores would be limited. One chore I had been postponing was cleaning the pool filter, simply because I didn't want to chance getting wet while it's this cold. However, the filter was dirty and prevented the pool-sweep from doing a proper job. About one o'clock, it looked like we might have a break in the weather, so I decided to chance cleaning the filter. Everything seemed to be going as I had hoped, and with the filter cleaned, the sweep began making a clean path across the pool bottom. While brushing the lagoon deck, I noticed a kink in the hose. Since the brush I was using has a telescoping pole, I hooked the tangled hose with the broom, and while walking backwards, stretched the kink out of the hose. Things were going great. The instant I hit the cold water I realized I had not been following my “watch where you're walking” rule. Forget drinking a cup of strong coffee as a morning wake-me-up. Jump into an un-heated winter pool instead. I was suddenly very aware of what I'd done. I was also aware I was wearing my leather jacket with my leather gloves in the pocket. I also realized I was wearing my battery operated wrist watch, and had my smart phone hooked to my belt. I was removing the watch as I climbed out of the pool, and instantly took the phone out of its case. Thank God I had unlocked the side door to the garage, since the next step was to remove my water-logged boots and clothes, a sight my neighbors didn't need to see. I was drying myself with an old ragged towel, now used to dry the cars, when I opened the door and called for Judy's help. After she stopped laughing, she brought me some dry clothes and asked me to write this into a blog. I guess I need to mention that I also got a good laugh at myself, thinking what I must have looked like trying to walk on water. I need to close this session by tipping my soggy hat to Timex for making a watch that appears to truly be waterproof. I also need to give Otter Box two or three tips of the soggy hat for creating a case that kept my phone fairly dry, only allowing a couple of drops to seep inside. The phone continued to work for a short period, then gave up the ghost. The killing moisture had evidently seeped through one of the ports used for earphones or charging. I am currently using my old cell phone while waiting for the new smart phone to arrive. One last word of advice is to always look where you're going. I don't know how many times I've said that to our grandchildren. Maybe it's time to follow my own advice.